Last week, I attended the TEDxBristol event ‘Dare to Disrupt’. As the speakers challenged us to be more disruptive in order to see new possibilities, I was reminded of two particular principles of how we should all approach the world – be more curious and be more courageous. Diversive curiosity – this is a ‘transient’, superficial attraction to novelty, e.g. flipping between TV channels or watching live Twitter feeds. This is more about jumping from topic to topic. But, it only scratches the surface of information, and is not used to gain deeper insights or understanding. Empathetic curiosity – this is about having a desire to learn about other people’s needs, to understand how and why they are thinking, feeling and behaving in certain ways, to learn how to then make those people’s lives better. It made me wonder about the kind of curiosity I see around me – and whether we could all aspire to greater levels of epistemic and empathetic curiosity. Leonardo da Vinci is probably one of the most famous curiosity kings of our time. Described as a man of “unquenchable curiosity” and a “feverishly inventive imagination”, da Vinci connected across multiple disciplines, including art, science, music, mathematics, engineering, anatomy and astronomy to name a few. There would be no doubting that da Vinci oozed curiosity – he was said to always carry a notebook around with him, so he would write and draw things as he was inspired or moved – in one of his journals he said “it is useful to constantly observe, note, and consider.”Some of these notes included some remarkable to-do lists. Calculate the measurement of Milan. Find a master of hydraulics and get him to tell you how to repair a lock, canal and mill in the Lombard manner. Observe the holes in the substance of the brain. Describe the tongue of the woodpecker and the jaw of a crocodile. Give the measurement of a dead man using his finger as a unit. Following in the footsteps of the great da Vinci, I’m inspired to fly the flag for curiosity – to immerse in different worlds and make connections across several disciplines, even when it’s not clear where it might lead. This is what we call ‘Link Thinking’, one of the 4 Thinking Strategies that we all have available to us – Link Thinking is all about finding fresh ideas and inspiration from one area of life and applying them to another. If curiosity is about uncertainly, it will naturally push us to explore the unknown. When leaving the well-trodden path of experience, the curious will inevitably find themselves in new territories where they are the ‘novice’. But fresh eyes can reveal new questions and ideas. Unfortunately, certain environments can erode and suppress curiosity. In schools, children are, at large, rewarded for having the answer, not asking a question. A 2010 study by Bronson and Merryman discovered that in the US, preschool children ask an average of 100 questions a day. Why? Why? Why? However, by middle school they found that children had pretty much stopped asking questions and, unsurprisingly, their motivation and engagement had plummeted. They concluded that these children didn’t stop asking questions because they’d lost interest – quite the opposite – they’d lost interest because they’d stopped asking questions. We are training children to put up their hands to answer questions rather than ask them! “In school, we’re fed textbooks rather than a desire to learn. We don’t know what jobs there are going to be in the future. We need ‘agile connectors’ of ideas. Comfortable of not knowing, but curious to find out.” Anna Starkey, creative director of We the Curious and one of the speakers at TEDx Bristol. In a world of constant disruption, we all need to be more comfortable with uncertainty. “What if the borders between humanity, technology, and nature are only in our mind, leaving us poorly equipped to navigate our uncertain future?” David McGoran, creative director of Rusty Squid and a further speaker at TEDx Bristol. It’s clear we need to break down these walls, and be more courageous to explore the unknown. HOW TO BE MORE CURIOUS AND COURAGEOUS AT WORK? “Time and again, innovations come from a fresh eye or from another discipline. Most scientists devote their careers to solving the everyday problems in their specialism. Everyone knows what they are and it takes ingenuity and perseverance to crack them. But breakthroughs – the sort of idea that opens up whole sets of new problems – often come from other fields.” Edward Carr, Deputy Editor, The Economist. Be prepared. 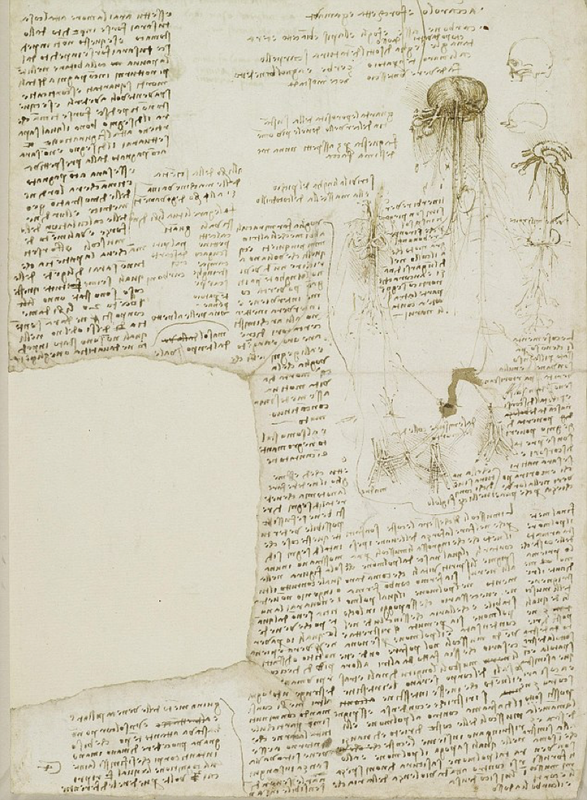 Let’s follow da Vinci’s lead and always carry a notepad to capture our observations and ideas. Or at least, get into the habit of using the notes pages in your phone to jot down thoughts as they happen. Exercise creative freedom. Ban phrases like “that’s got nothing to do with what we’re doing here” or “stick to the task at hand” which can suppress curious minds. Allow your mind to roam, bring in new ideas and influences from diverse disciplines, draw from different perspectives. And let’s all be open to inspiration wherever it may come from. Ask questions. We shouldn’t underestimate the power of questions, and we all need to get better at asking questions. Remember, you don’t need to be an expert in an area to draw ideas from it – we can all copy, borrow or steal new ideas. Release your inner child and ask Why? Why? Why?